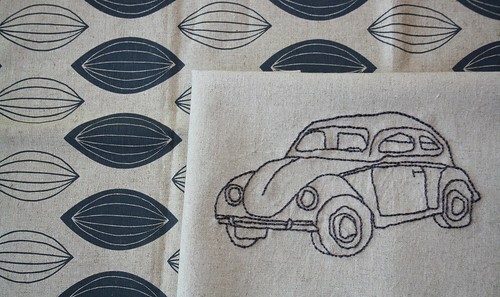 VW embroidery, pattern from pepperstitches, originally uploaded by chunkychooky. I think it is! There needs to be more stitched cars in the world. I would also be very interested in seeing stitching ON cars - how cool would that be? As for stitching *on* cars: here ya go! Holy-moly - how did I miss that?! Love it. Might have to do cars for the kid! He would love it. Diggers & trains would be even more loved but that would be rather up, unlikely! What about winning a great silk shawl? I love your stitchery. I have always loved Beetles. We had 3 of them and then graduated to a Rabbit when our son was born. I love the stitching, but what do you make with them when you are done? I need ideas. You can only have so many coin purses or pin cushions.